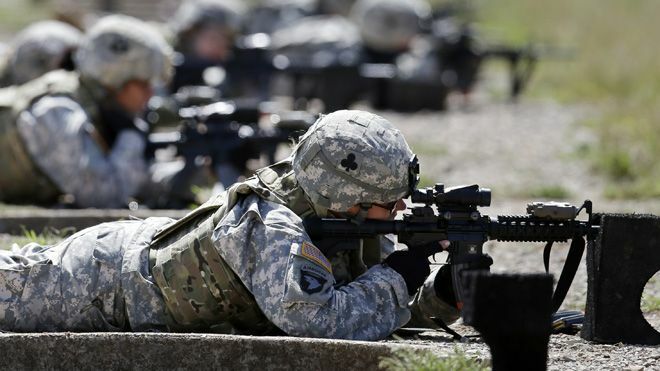 Guest article: “Women in Combat?” by Andrew P. O’Meara Jr., Colonel, United States Army (retired)… In the context of moral injury and PTSD, do we really want to send mothers into combat? Are we really thinking this through when recognizing the life after war multi generational implications of mothers nurturing children? I don’t claim to be an expert, but I’ve been there and done that; and it’s no picnic. I share the following recollections of combat and its impact upon soldiers reluctantly, because it is still painful to share bitter memories. I do so because it is important that we heed the hard lessons of close combat. A recent email message by a female Marine commissioned officer (1) provides reasons why assigning women to infantry units is not a good idea. She is absolutely right. Her assessment of the problem is excellent. She points out the physical differences between men and women that are here to stay. And they don’t make life easier, if the infantry squad has a woman on two in its ranks. I will not attempt to restate her case. However, I will share her observations of Israeli experience with women in combat that has been catastrophic, leading to much higher casualties in the combat units concerned. 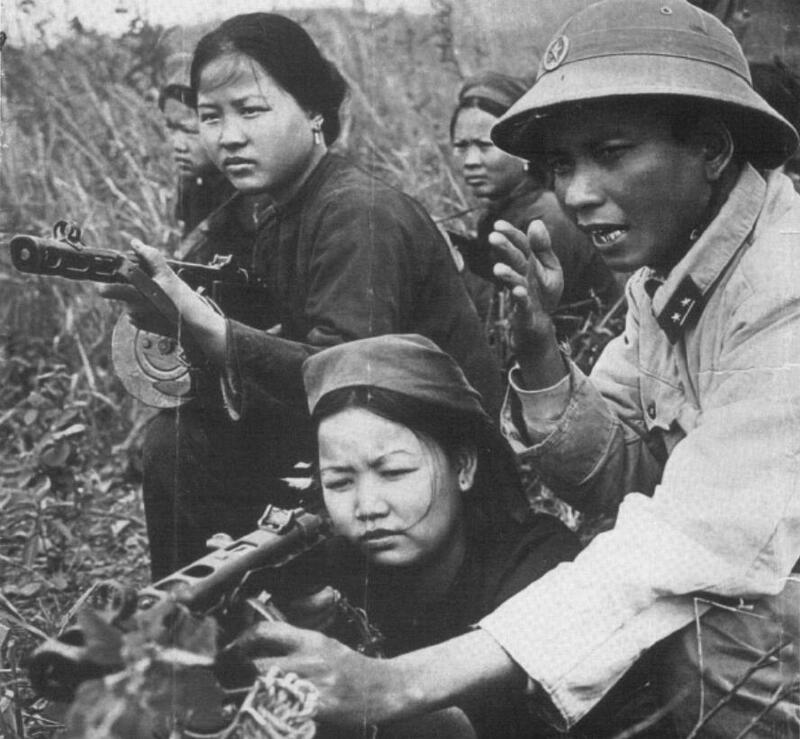 The Viet Cong, our old adversary, used women in combat, but only at the local militia level (village). Regional VC guerrilla units didn’t incorporate women in their ranks. During combat operations to clear tunnels in the Iron Triangle in 1963, the mechanized infantry unit I was advising discovered the rosters of units in the local area. The local VC guerrillas had two or three women in most squads. The above photo shows Vietnamese women undergoing training for combat. The North Vietnamese Army had women in its ranks, but only in support roles as has been the case in the U.S. military. My problem with women in combat is that it changes people in ways that are detrimental to the individual and society. The impact of combat is directly proportional to the intensity and duration of combat. Individuals who are more sensitive appear to be at higher risk of suffering lasting psychological harm. During battle most soldiers bury the memories too horrible to remember; the subconscious buries the horror at depths beyond our reach. Those who come out of battle after long service in line units with many fire fights during many campaigns are hardened. Soldiers of long and hard fighting often return from war without emotions. Many are hard as rocks emotionally. And those who eventually exhibit symptoms of PTSD are incapable of nurturing; they can’t parent. After about twenty years many hardened veterans experience symptoms of flashbacks and dreams of combat, when suppressed memories of battle begin to break free of their suppression. Our experience with professional soldiers suggests that the subconscious can no longer suppress the stuff we couldn’t live with after a period that may last as long as twenty years or more. By the time we realize we have PTSD, we are eaten up with anger and have made a mess of parenting. That’s the problem with women in combat. Their children will have mothers incapable of nurturing. And it’s not her or their fault. And the next generation will be hurt forever. That’s why the Spartans never permitted their women to be warriors; although, they were plenty tough. They placed the frail or handicapped infants outside the village to die, because their society required all males to be warriors and mothers to be capable of child rearing. I probably should have been a professor of English literature or history at some small town in the middle of nowhere. My first love was English literature followed closely by history. Upon graduation from high school, I had a scholarship to Yale; but my father insisted I take the exams for the Academy as well. I was awarded an appointment to the Academy, which he insisted I take. Turns out I loved the Army and service with American soldiers. But after thirty years of soldiering I was hardened; and I had PTSD. In my heart of hearts I suspect I was ill equipped by temperament for slaughter and killing. I did my share of killing, especially during my service in the 11th Armored Cavalry Regiment (ACR). The Regiment was commanded by Colonel George S. Patton, III, a great trainer and aggressive leader. The Regiment was a great team and conducted combat operation that inflicted massive casualties on the enemy during Patton’s tenure of command. The team included USAF tactical air and Army artillery that together inflicted heavy casualties upon our opponents. Patton thrived on taking the war to the communists, who had invaded South Vietnam. We killed many, to include Patton and his command group. Most enemy casualties were inflicted using air strikes and artillery, but many were inflicted in close combat with side arms. I served as Patton’s intelligence officer. I was responsible for developing hard intelligence on the enemy, which resulted in targeting and pitched battles. In my judgment, the service in the 11th ACR didn’t cause my later problem with PTSD. I was already filled with anger at the North Vietnamese soldiers as a result of my earlier tour of duty as an ARVN advisor. Our opponents in Vietnam killed their opponents without mercy, resulting in massive atrocities unreported by the media. As a result I experienced the loss of friends, who were killed or maimed. In the case of the Vietnamese soldiers their families were targeted as well, resulting in the slaughter of entire villages. By the time of my second tour of duty, I had no fear, a symptom of suppressed emotions (PTSD). Make no mistake. During my soldiering I saw no atrocities committed by our soldiers. Although we fought hard, we fought in accordance with the Geneva Conventions. Despite our aggressiveness in combat, we treated prisoners well; and we were rewarded with vital information. I personally observed numerous young North Vietnamese soldiers after their capture, who willingly offered information. Many had no stomach for combat. They had gone to war at gun point. Their willingness to share information on their former units ended abruptly, when they entered a POW camp that effectively returned them to Communist control by enemy cadre. My experience with VC was different. Those, who managed to survive the Tet Offensive, were tough veterans. During my service with the 11th ACR, the VC normally refused to cooperate during interrogations, if they lived long enough to become a prisoner. They earned our respect as determined fighters. I never had a bad dream about killing communists, but the loss of our brave troops broke my heart. And I suppressed it all forever; but it didn’t last. I had to suppress it to do my duty. Had I permitted myself to grieve and dwell on the dead and dying, I wouldn’t have been ready for the next fight, which was tonight or tomorrow. But suppressed memories return; and many veterans ended up with PTSD, which was my experience. Close combat, especially over extended periods, changes us in ways that destroy both long term memory, as well as our emotions. Those suffering from PTSD after long periods of combat are emotionally dead and incapable of nurturing – parenting. We know this from long experience. Our children don’t need mothers filled with hatred for communists, or Muslim terrorists, or any enemy period. They will be incapable of nurturing; and they will fail as mothers. The Spartans knew that, but we as so PC we are going to make political points by selling out the unborn children of our children’s children. We have already spent them into debt; now it is apparent that the current Administration will give away their right to have loving mothers. It’s irresponsible. It’s wrong; and our society will end up paying a terrible price for short term political gains to learn what the IDF has learned the hard way. 1) “Some advice on women in combat from a female veteran.” Full text of posting dated January 27, 2013 by Jazz Shaw, available by request stevesparks@centurytel.net. This entry was posted in Uncategorized on February 14, 2013 by stevesparks. Col. O’Meara brings up the social issue of the impact of war on children and families. Current statistics suggest 25 – 30% of combat veterans suffer from PTSD following combat experience; presumably the numbers would likely be similar for female veterans. The resulting moral injury affects fathers AND mothers. It is the responsibility of men and women to weigh the risks of such moral injury in making the very personal choice of serving in the military, and it is our responsibility as American citizens to support their needs when they return from war. Further comments by Andrew P. O’Meara Jr.
· Soldiers returning from war with long exposure to the violence of close combat make up much of the population of our PTSD therapy groups conducted by VA hospitals and clinics across the country. I have found that some participants in the therapy groups have more than one war under their belts; and many are highly decorated for valor. A close friend of years in group therapy is a retired Command Sergeant Major. 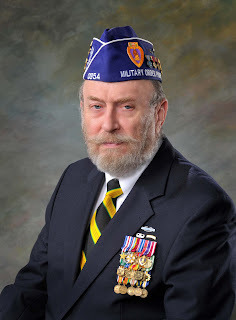 He is a combat infantryman, who won the Distinguished Service Cross in the Korean War and multiple decorations for valor during three tours of combat duty in Vietnam. He has a difficult challenge with PTSD – what professionals in the business call survivor’s guilt. From long experience with PTSD victims suffering from extensive combat duty, I can witness to the fact that their PTSD disabilities are serious. We will take PTSD to our graves. I share this observation to correct misperceptions of the problem posted on the blog. · I lost my first marriage due to long family separations that included two tours of combat duty in Vietnam. I have remarried. My experience, while limited in scope, suggests that women are more nurturing than men. Obviously, there are exceptions to my generalization. To the extent mothers make better mothers than males, their nurturing character is vital to society in rearing healthy children; e.g. the Spartan rule of cultural roles in society. To the extent that females with nurturing personalities are more sensitive than male warriors, and in worst cases the Neanderthals (typical DL in the SEC) who gravitate to fields of deadly combat; they are at greater risk to acquire PSTD. Thus my personal warning to those who seek opportunities for women in close combat. Expect higher rates of PTSD, because we will experience more mental problems (PTSD) with an increased percentage of combatants at risk, if women are allowed in the ranks of our combat infantry squads. To the extent this truism is considered to be objectionable (not PC), blame it on the Spartans. “I Agree with your blog. I totally disagree with women in combat and gay acceptance in the military. The most difficult challenge for our Navy personnel is females aboard ships of the line. Particulary disturbing is the authorization for women on submarines and for SEAL training. I could care less what the liberal politicians tout. They have never lived on a warship at sea. US Capital Bldg. heads. I suspect you pukes prefer to sit anyway.